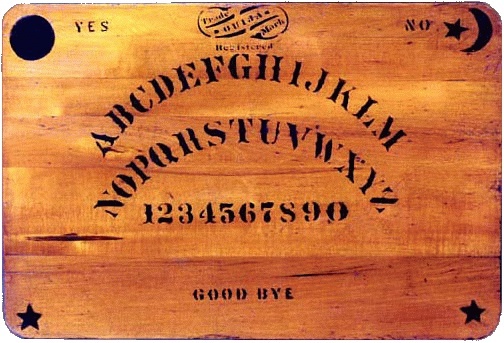 Eggcorns, jury-rigged words that use the pull of parallel meanings to replace legitimate words, include such novel terms as fair’s wheel, pinecomb, witchy board, blastfumy, and bodyhouse (on-the-fly substitutions for Ferris wheel, pinecone, Ouija board, blasphemy, and bawdy house). Unlike puns and Freudian slips, eggcorns find homes in the vocabularies of thousands, even millions, of English speakers. The word eggcorn was coined and described in 2003. Over the next several years, an intense search by language amateurs and professionals turned up thousands of candidate eggcorns. The popularity of the term continued to spread and in 2010 the term eggcorn made its first appearance in a major dictionary. Each year articles dedicated to this neologism appear in major magazines and newspapers. 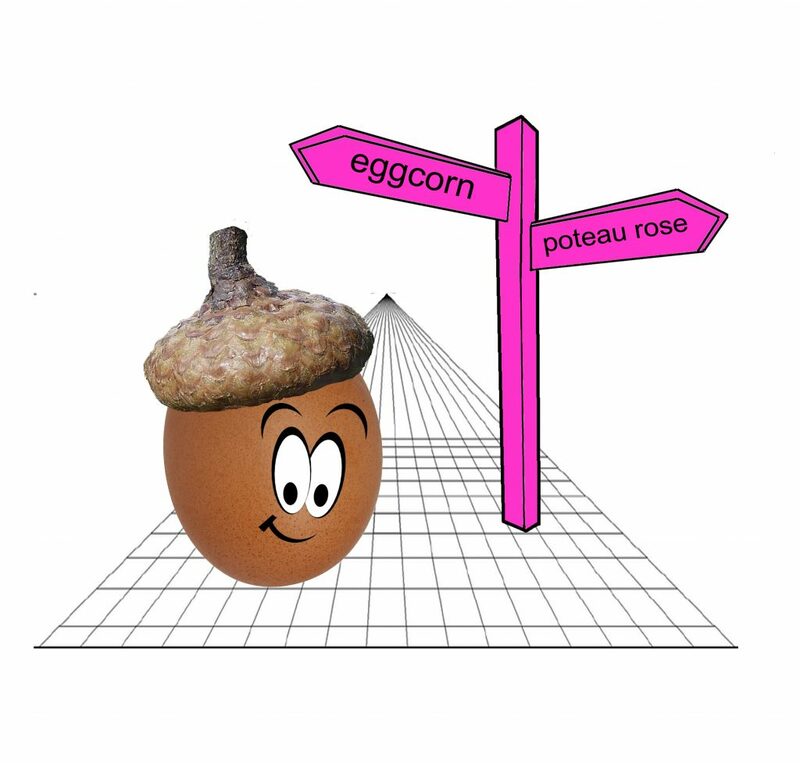 Eggcorns play a role in several recent trade books on language. OED entry for "eggcorn." The first dictionary adoption. Now, in the first book devoted exclusively to this neologism and its development, the best eggcorns to emerge from The Great Eggcorn Hunt are collected in one place. 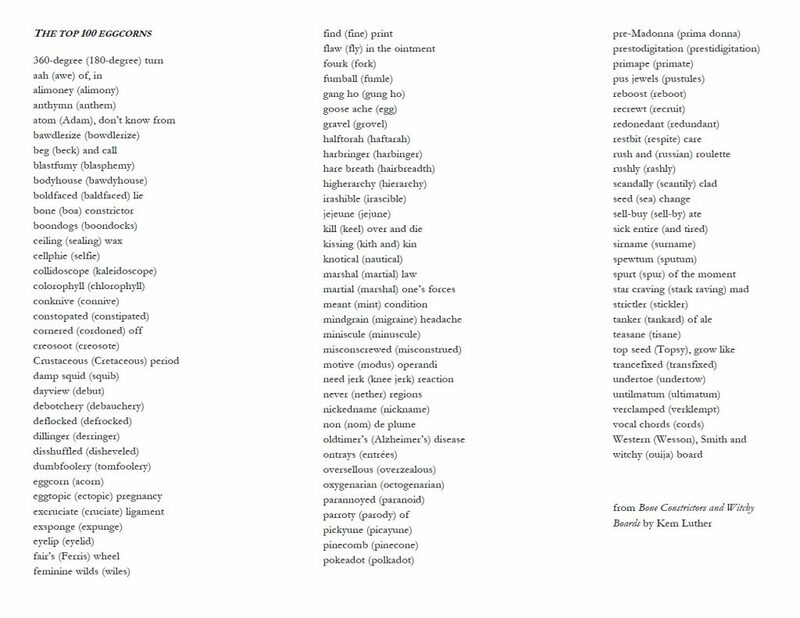 Among the more than 600 eggcorns described and dissected in Bone Constrictors and Witchy Boards are the author’s boxed selections for English’s top hundred, the best of the best (click on the image to see the list). Some are poignant, others charming. Several are funny enough to damage weak ribs. The new book lists the major characteristics of eggcorns and separates them from their close cousins, the mistakes we know as malaprops, mondegreens, spoonerisms, folk etymologies, and Freudian slips. The definition is then carried into the domain of Big Words (massive collections of text such as the World Wide Web and Google Books) in search of the best eggcorns. Bone Constrictors and Witchy Boards surveys the fields of medicine, cuisine, religion, sport, technology, and literature. Chapters are also devoted to eggcorns triggered by foreign words entering English and to NSFW eggcorns. In the final section, the search turns to linguistics, probing its latest theories to see what they can tell us about the mechanisms that underlie eggcorns.